So argues conservative pundit and Bush I assistant secretary of education Ravitch (Left Back, 2000, etc.) in a hard-hitting attack on the educational establishment and the interest groups, left and right, that control it. It’s not so much that youngsters today are coddled with sensitive textbook language that bars reference to Africans as slaves or Jews as classical musicians or that dances around the non-niceties of Islamic fundamentalism, though this sort of censorship is awful enough in Ravitch’s estimation; it’s that contending political groups, from the Christian right to gay and lesbian alliances, have so thoroughly inserted their agendas into the classroom that it’s become practically impossible to depict anyone doing anything, whether it’s George Washington crossing the Delaware or George Washington Carver finding economic uses for peanuts, without arousing someone’s ire. The governing idea in the resulting content-free, actor-free, active-verb–free educational scene is that no one be offended by any idea he or she is ever exposed to in the classroom—European Americans excepted, Ravitch writes, for they “are the only group that must be taken down a few pegs; their self-esteem is too high.” Battles over curriculum and textbooks are nothing new, of course, as Ravitch shows; still, those battles have become particularly bitter in just the last few years: school boards, educators, and textbook publishers have so utterly given in to political pressure that no opinion—and almost no piece of literature—can be aired in a venue that once prided itself as a forum for the free expression of ideas, and that can now no longer teach anything of real value. 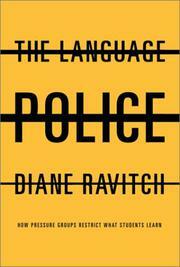 Ravitch’s assault is far-reaching, admirably complete, and generally nondoctrinaire. She takes on ideologues of whatever stripe, finds them all wanting, and offers, in detail, a reasonable alternative in the form of a curriculum that explains that sometimes history hasn’t been very nice while allowing historical actors to speak for themselves. Of tremendous importance to parents, educational reformers, and anyone concerned with the myriad failings of the present culture.